Animals have shaped O'Reilly. Now it's time to give back through the O'Reilly Animals campaign. No one needs to be told that the tarsier and the camel are O’Reilly Media icons. So are the llama, the elephant, and the flying fox. And hundreds of other animals. Authors speculate on the significance of the animals chosen to grace their books. Customers take pictures of their collections and send them to us. Everyone has a favorite — and spoofs have abounded. In other words, it’s an understatement to say that the use of classic animal engravings on O’Reilly books has been a success. Unfortunately, what it hasn’t done is help the animals themselves. The truth is that a large number of the animals featured on O’Reilly books are threatened or critically endangered. We’ve always used colophons in the books as a way to tell readers about the animals. Now we want to use social media and the web to tell those same readers how they can contribute to helping the animals in real life. At OSCON this week, we’re launching the O’Reilly Animals campaign to raise awareness of the animals’ plight, with a special emphasis on the ways in which people and organizations are using technology to help save and restore endangered animal populations around the globe. With an eye-catching display and the “Animal Ladies” on site (Edie and Karen Montgomery, the Animal book cover designers), we’ll be encouraging members of the O’Reilly community to get involved in whatever ways they can. 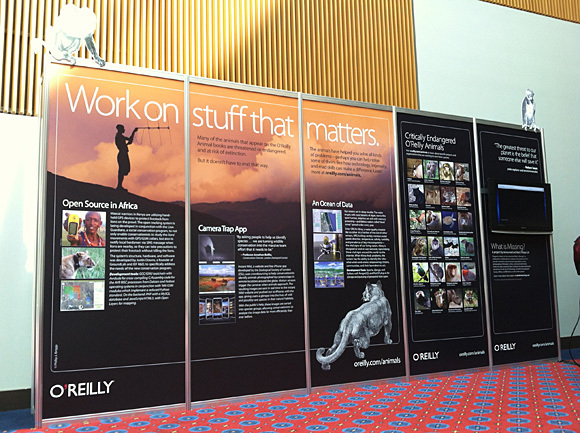 The O’Reilly Animals display at OSCON 2012 in Portland, Ore.
Each week, we’ll highlight a different animal from our catalog. Through Facebook and Twitter, Tumblr and Pinterest postings, we’ll pose a question about an animal, with a link to a longer, detailed article all about that animal on the O’Reilly Animals website. On the O’Reilly Animals site we’ll present short overviews of projects we think are interesting, with links to project websites as well as relevant articles, interviews, and other resources. We’ll also list volunteer opportunities for developers to use their expertise to help some of those projects move forward, such as developing mobile apps and remote wireless sensor networks. We’ll be adding a blog to the site, with guest contributions from organizations like the Zoological Society of London (ZSL) and the Great Primate Handshake project, among others. If you have any ideas, suggestions, questions, or comments about the campaign, the website, or ongoing projects, we’d love to hear from you at animals@oreilly.com. And if you’d like to help in any way, including researching and writing about interesting projects, we could certainly use your assistance! Here’s what we know for sure: one person with a bright idea and a little technology can make a big difference. A community of people with bright ideas and expert technical skills — the O’Reilly community — can make a huge difference.